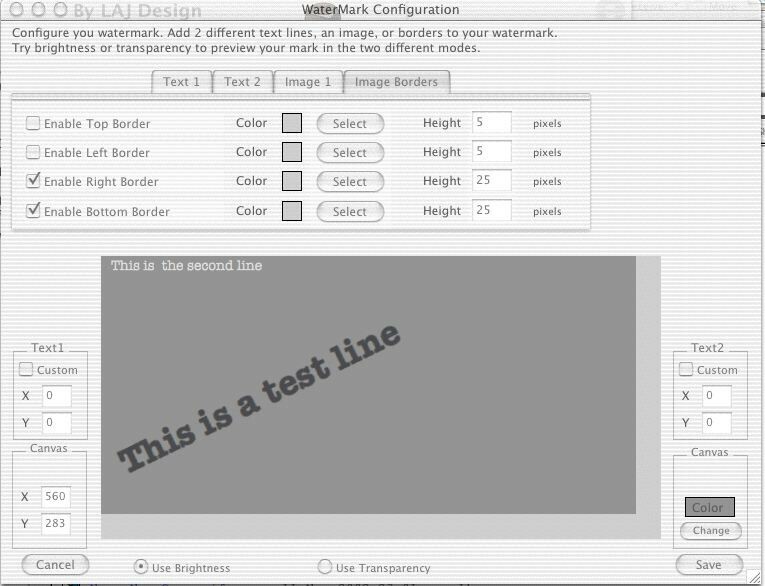 DropWaterMark 4.0.4 is other software developed by LAJ Design. WaterMark images easily * Configure your watermark *	Replace the image or make a new image *	Mark an image on an image *	Include border in your watermark *	Mark entire folders at a time Available for Windows and Macintosh. This graphic apps software is shareware, which means you can download and use DropWaterMark 4.0.4 for free during the trial period (usually for 30 days). At the expiration of the period you will have to buy the other product for $16.50. 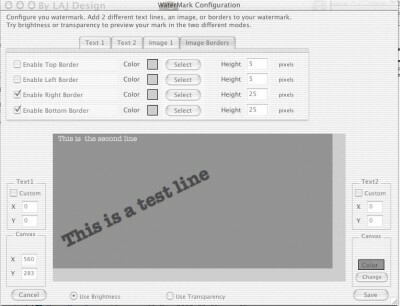 DropWaterMark 4.0.4 is available at regnow and LAJ Design website. DropWaterMark 4.0.4 supports different languages (including English). It works with Windows 98/XP/Vista. We have tested DropWaterMark 4.0.4 for spyware and adware modules. The software is absolutely safe to install. Our website has thoroughly tested graphic apps product DropWaterMark 4.0.4, written the review and uploaded installation file (1427K) to our fast server. Downloading DropWaterMark 4.0.4 will take minute if you use fast ADSL connection. DropWaterMark allows you to watermark images easily by simple dragging them onto the application.